This casual Skirted Ottoman makes a great addition to any living room, and can easily be matched to your pre-existing decor by choosing from over 600 exciting colors and patterns to customize the piece with. Pair it with a chair to create a relaxing footrest after a long day, or use it as a spare seat when entertaining a large crowd. Place a platter or tray on top to transform the ottoman into a cocktail table, perfect for placing drinks and snacks on. However you use this ottoman, you will love the look of its casual elegance in your home. The Charlotte Skirted Ottoman by Kincaid Furniture at AHFA in the area. Product availability may vary. Contact us for the most current availability on this product. 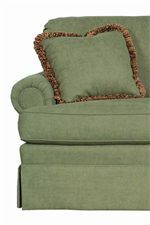 The Charlotte collection is a great option if you are looking for Casual furniture in the area. Browse other items in the Charlotte collection from AHFA in the area.